Anshi National Park is located in Uttara Kannada district, in the Indian state of Karnataka, bordering the state of Goa. The park is a habitat of Bengal tigers, Black panthers and Indian elephants, amongst other distinctive fauna. It is notable that Anshi National Park and Dandeli Wildlife Sanctuary were together granted the status of Project Tiger tiger reserve, being declared as 'Anshi Dandeli Tiger Reserve' in January, 2007. The 340 km2 (130 sq mi) Anshi park adjoins the Dandeli Wildlife Sanctuary, and together with six adjacent protected areas in the states of Goa and Maharashtra, forms an almost uninterrupted protected forest area of over 2,200 km2 (850 sq mi). Located in the Western Ghats range from l4°54' to l5°07' N latitude and 74°l6' to 74°30’ E longitude. Anshi's elevation varies from 27–927 m (89–3,041 ft) above MSL. Despite high rainfall in this area, water holes go dry very early in the summer because the soil is laterite, with very minimal water-holding capacity. The park is in the ecoregions of North Western Ghats montane rain forests and North Western Ghats moist deciduous forests, both of which are deemed endangered by the World Wide Fund for Nature (WWF). 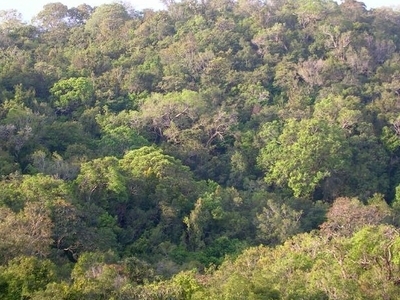 The forests have high biodiversity. 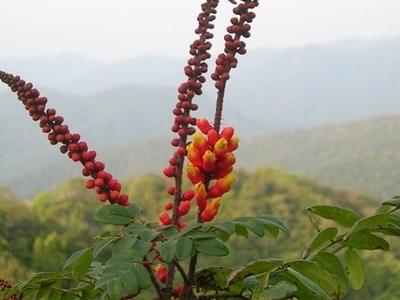 Some common trees and plants here include: 'bintangur', Calophyllum (wightianum), Malabar tamarind, Garcinia morella, Knema attenuata, Hopea wightiana, Tetrameles nudiflora, Blackboard tree, Flacourtia (Montana), Machilus (macrantha), Carallia (brachiata), Aini-maram, mulberry (lakoocha), true cinnamon, Bamboo, Bauhinia, Eucalyptus, Lantana, Silver Oak, Teak and Jamba. The black panther, elephants and tigers live in the park but are rarely seen. Other large mammals here are Indian bison, Sloth bear, Indian wild boar, Bonnet Macaque, Northern plains gray langur, Gray slender loris, several deer including: Barking deer (Muntjac), mouse deer (Chevrotain), Sambar deer and Spotted deer (chital or axis deer). Wild Dog, Jackal, Jungle Cat, Leopard Cat, Small Indian Civet, Indian Gray Mongoose, Flying Squirrel, Porcupine, Malabar Civet, Indian giant squirrel and pangolin also make their home in the forests here. Reptiles in the park include the King Cobra, Spectacled Cobra, Russells Viper, Saw-scaled Viper, Common Krait, Indian Rock Python, Rat snake, Vine Snake, Green or Bamboo Pit Viper and Monitor Lizards. Interesting birds include the Ceylon Frogmouth, Great Hornbill, Malabar Pied Hornbill, Malabar Grey Hornbill, Indian Grey Hornbill and Asian Fairy Bluebird. Around 200 species of birds are recorded in the park. These include the distinctive Adjutant Stork, Ashy Woodswallow, Black-crested Bulbul, Blue-headed Pitta, Brahminy Kite, Broad-billed Roller, Crested Serpent Eagle, Great Hornbill, Golden-backed Woodpecker, Malabar Pied Hornbill, Sri Lanka Frogmouth and Yellow-footed Green Pigeon. Here's the our members favorite photos of "National Parks in Karnataka". Upload your photo of Anshi National Park!